In Spain, there's a long tradition of getting together for lunch with the whole family. Country workers couldn't come in from the fields to do that, so they cooked for themselves in the fields and thus Paella was born. Paella is now one of the most famous Spanish dishes. Once you have eaten it you will want it again and again. There is no one way of making paella, but one thing every chef (“Paella Man”) has is his own way of making it and ingredients also vary. Paella is cooked in a wide and short pan usually for 25-50 people, as ask any Paella Man; the flavour comes from the abundance of a variety of great fresh ingredients. Many of the toppings are added as a last step at the top of the paella. Famous chef’s the receive the accolade "Paella Man" include Gerard Nebesky of San Francisco, who travels up and down California's coast 'catering' paellas. 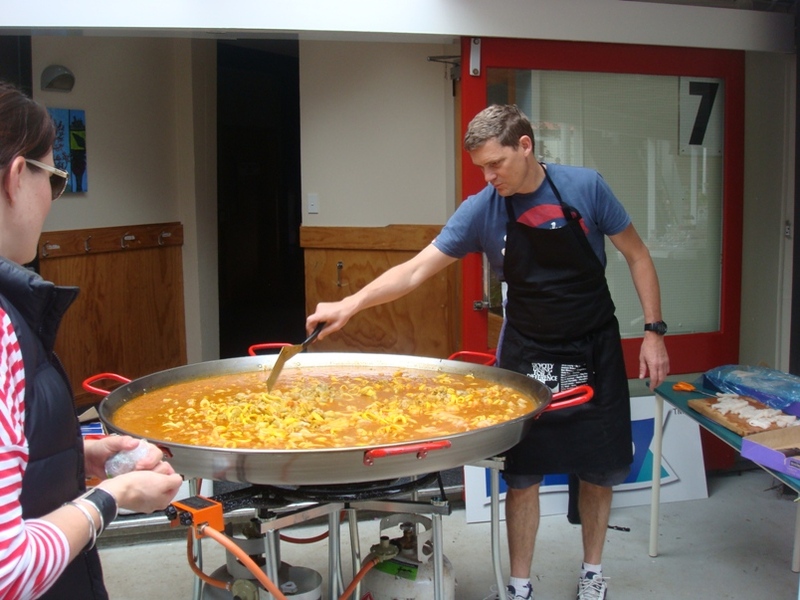 Cook at Home Paella offers you the opportunity to become “Paella Man” for the day.